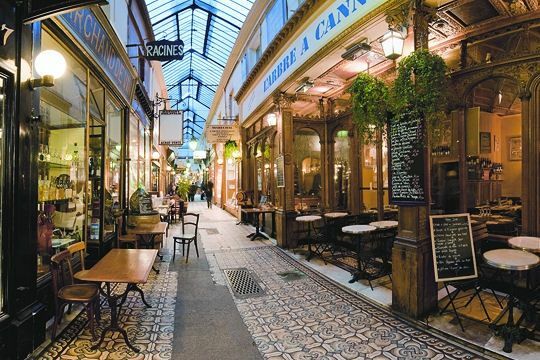 When Kojima Company's owner, Sarah Canizzaro, visited Montréal last spring, I gave her my most sentimental strand, which LeDuc was hoping to renovate for my birthday in mid-July. Today, American Thanksgiving, is an apt day to tell the story. Like Sarah, Missi had interests beyond flawless rounds; she said, "I don't mind seeing where the oyster burped". She'd wear long chandeliers with hiking shorts, but then, this six-foot goddess could pull off anything. As the years passed, I lost my heart to the earthier keshis and baroques. And by the early '00s, I also lost Missi. She adopted a reclusive life, and left behind friends and lovers world-wide. I wore that necklace often, for it was as close as I could come to embracing her. 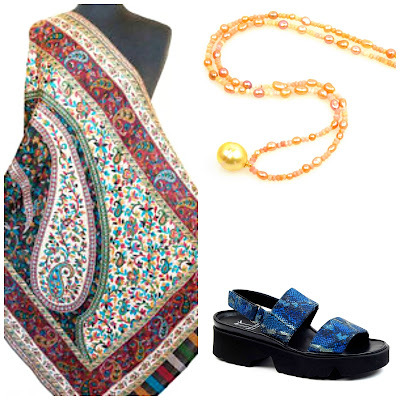 Before Sarah returned to San Rafael, she asked if I preferred pearls or coloured stones. 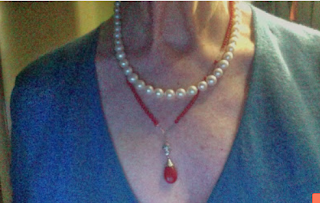 I chose pearls and requested a rope. The 60-inch rope arrived on my birthday; I was thrilled! Sarah had added many tiny-to-small akoyas and three large golden baroques. 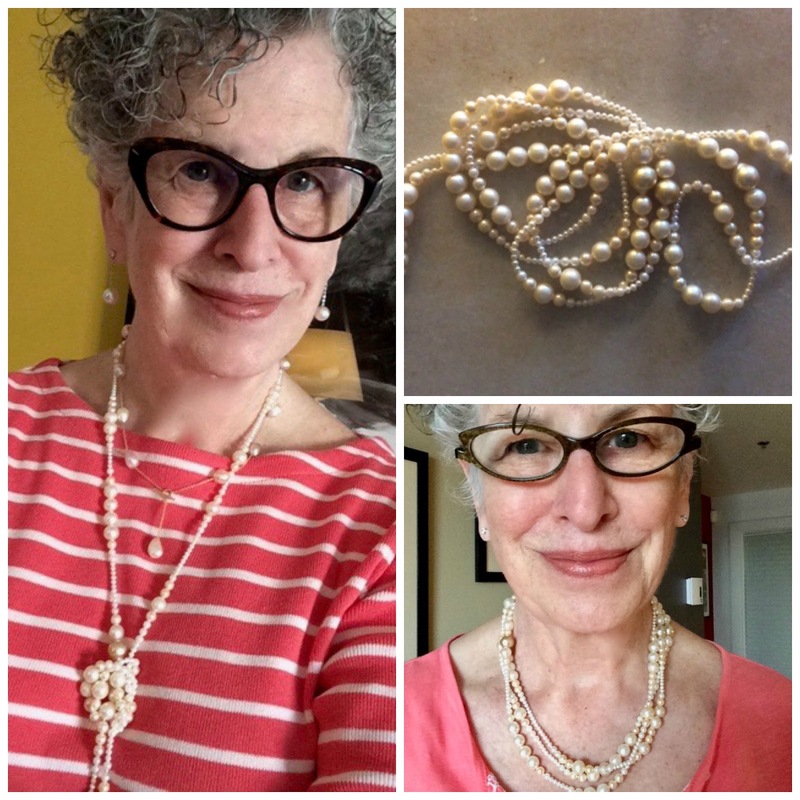 She matched my champagne-toned pearls perfectly, and somehow made them look glowier. The variation among the sections—none is like another—is harmonious; the little akoyas keep the piece light and drapey. LeDuc said he "fabulously loved" it. Left, knotted (and worn with tin-cup baroque CFWs); top left: the pearls; bottom left, tripled. Sarah used the original gold clasp; clasps are a make-or-break detail to me— but if you'd wear the piece only as a long rope, not necessary. This one was made by a jeweller pal of Missi's; she said, "Steven gives good toggle." 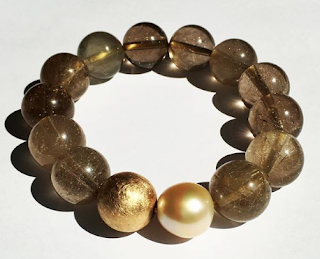 If your old (but still in good condition) pearls are deeply sentimental, but the style is no longer 'you', you can have a perfect new piece for a modest investment unless you enter the land of (new) precious gemstones. I love Kojima for both their pearls (every variety, size, colour; many unusual) and dedication to their clients' delight, but you may also have a local jeweller who can do a knockout reno—and if so, you're lucky, because pearls are a world unto themselves. Kojima's studio is in Marin Country, near where Missi lived when I first knew her. In the early '80s we sat on a dock at Point Reyes Oyster Company, I in her pearls and she in my turquoise-and-silver bracelets— between visits, we liked to swap jewellery. Missi said, "You should wear pearls; why don't I look for some for you?" A decade later, she called from a gem show to say, "I found them, but we have to pay by tomorrow. Wire me the money!" When I heard her certainty, I bought them sight unseen. Several months later, she flew to Toronto with the pearls in her pocket. Now, they have returned from their second trip to Marin County, transformed by a talented artist. Even if that connection is coincidental, they feel wrapped in love. That is a gorgeous reworking. Simply lovely. A rope that wraps as a shorter strand is brilliant!!!!! If I understand properly, you did reconnect with Missi? And yes, that is a beautiful rope. pearls are so versatile...timeless and classic. Wow, wow, wow. I love the new strand and the story behind it. You look marvelous. And, yes, I've been eyeing a few pieces from the Kojima website. Happy US thanksgiving to you and yours. Laura Jantek: Most ropes are versatile, especially if they are not too big and heavy. And they are perfect for using older pearls. lagatta: No, I have not. hostess: Thanks,this is why I like to turn to someone with decades of experience when it's time to redesign. Leslie Milligan: Oh me, too... Happy Thanksgiving to you, or as we call it here, Thursday. What a lovely story, your friendship and the pearls interwoven - separating and somehow coming together again. And the new piece is just as lovely as the story behind it. Thank you for sharing both. BTW you look wonderful in those coral tones. A great post...and a great set of pearls reimagined...I also have a lost friend that I still miss...someone who pulled away from the world. Oh, I love the new strand! They're modern and playful, but still elegant. Perfect for you!! Emma, so do I. Sadly she died, I think she was still grieving her late husband, chain smoking from dawn and drinking far too much, and not really eating. She had been a prominent editor. No more clues. A very sad thing is that a friend and confidante she was still in contact with died a couple of months before she did.